Although a beach break can sound very appealing, spending an entire week doing nothing more than sunbathing can get a bit repetitive. Why not introduc a bit of local culture and history to your beach holiday? Majorca is a classic destination to choose for a beach holiday, but if you pick the right part of the island, you can also be within easy reach of a host of amazing historical and cultural attractions. One place that certainly offers the best of both worlds is Playa de Palma, which is just 10 km away from the island's bustling capital. Here are a few ideas on how to combine a stay by the seaside with a dash of history. Playa de Palma is an excellent place to stay (you'll find information about hotels in the area here), the golden sands are beautiful, plus it's close enough to Palma that travelling to the city isn't a hassle. Playa de Palma is one of Majorca's many Blue Flag beaches, which means it meets the highest standards in terms of cleanliness. As it's around 4.5 km long and 50 m wide, there's lots of space for you to spread out, even when it's busy. The picturesque promenade at the back of the beach is lined with cafes, bars and restaurants, so you never have to go too far if you need refreshments, and there are other facilities like toilets and showers dotted along the bay. Playa de Palma also has a great range of water sports on offer, with waterskiing and jet skiing available for thrill seekers. Take the opportunity to go paragliding here, getting a bird's eye view of the stunning beach and sea below. 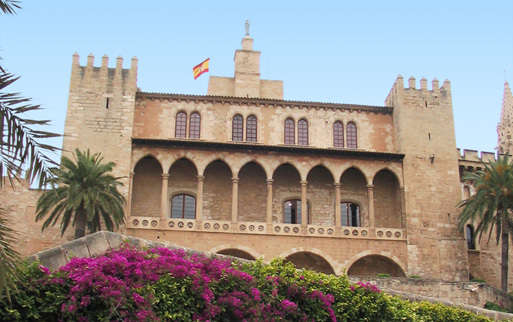 When it time to take a break from the beach, soak up a bit of history and culture, so head into Palma to see some of its top sights. There are numerous buildings in the city that give a nod to its varied heritage. Almudaina Palace - This building is of Moorish origin, although many of the design features you can see today were added during the 14th century and are distinctly Gothic. The monarchs of Majorca once resided here, although it's now been converted into a museum. Majorca Cathedral - This is an amazing piece of architecture that's situated close to the Almudaina Palace. It dates back to the 13th and 14th centuries and is predominantly Gothic in design, although Antoni Gaudi made some alterations to the building at the start of the 20th century. Inside there are beautiful stained-glass windows, as well as a stunning ceramic mural created by Miquel Barcelo. Bellver Castle - Situated on a hill overlooking the city, Bellver Castle is an impressive sight. What makes it really stand out is its circular shape and three imposing towers. The views from here are breathtaking, while inside the castle is the city's History Museum, where you can take a look at the archaeological exhibits that have been recovered from sites around the island.